Are you facing problem with email marketing? Thousands of business owners feel frustrated for low opening rates as an only fraction of readers who has sent emails click through their websites. Obviously, they are not getting full potential exposure from email marketing. All of us receive too many emails in our Inbox, and this makes it difficult for genuine brands to make through the clutter, and they all treated as spam. The popular social media have entirely changed the way people communicate, thus pushing the email marketing to the point of redundancy. The question is whether there is any future for email marketing? The answer is definitely yes, but it has become a lot more specialized arena. Business email marketing fulfills this specialization need by providing solutions and proven techniques for making money using email marketing. When used correctly, it still provides a very effective channel of communication. The most important factor is the cost effectiveness, whether you are running a small or big business. Email marketing is, in fact, changing and becoming a more specialized form of marketing, and you need to keep pace with the changes. The mails have to be personalized and matched with the behavioral data and content by research in order to be effective and the marketers who are doing this are getting higher returns for increasing the relevance of their emails. 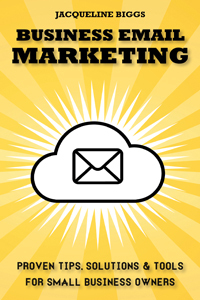 The email marketing still remains the most effective channel of business marketing for many companies. The e-book shows you the secret of collecting the most targeted database and thus shows you the techniques to improve your email marketing. You will get great value from this book even though you might be using email marketing for years, and this is for sure that your marketing skill will improve. Jacqueline explains everything pertaining to targeted email marketing that is most suitable for your business. Better equipped to choose the perfect email service provider. Better equipped for generating targeted database. Better equipped to identify and categorize profitable niches in your database. Better equipped to adopt a marketing strategy that delivers better results. Better equipped to write good and compelling content. Better equipped to identify the metrics you need to focus. Better equipped to integrate email marketing with the social media.